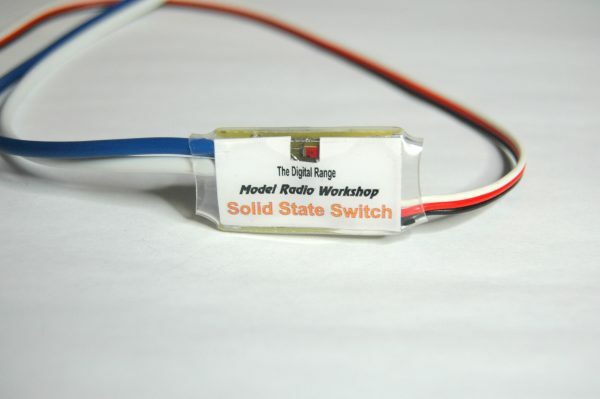 The Solid State switch has been designed for situation where relay contact bounce could be a problem or situations where rapid switching is required etc. Failsafe if no signal when used on P.P.M radio systems. The ON direction is selectable by the end user. L.E.D indicator on the unit to show the on point. Two units can operate on one channel when set to opposite directions. First it is recommend that set the channel you are using to operate the Standard Relay Switch to 100% travel, once this is done the Standard Relay Switch will switches on around 75% of the travel channel you are using. If you find the Solid State Switch is operating in the wrong direction for the switch channel you are using and channel reverse is not available on your radio or you are operating it with another device on that channel via a “Y” lead that needs to operate in a particular direction. Then press and hold the key and switch your radio receiver on, this will reverse the action of the switch unit, carrying out the same operation will change it back again. When using the switch with electric motors always fit suppression capacitors to stop contact arcing. If suppression is not fitted the life of the contacts will be much reduced. 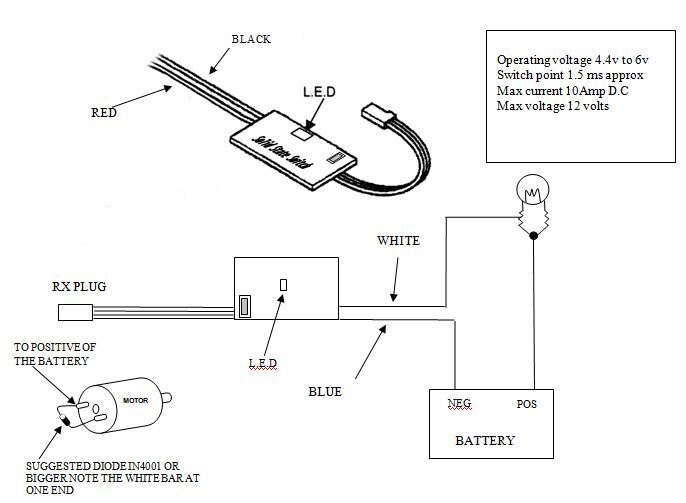 Where possible measure or work out the current of the load to be borne by the switcher, as the relay contact will only stand 10amps. Any switchers returned with burnt out contacts will be considered as damaged outside the warranty.